I have always been a big reader, and I love the classics. However I have never really been a fan of Charles Dickens. It’s partly because I love the scandal and glamour of Georgian aristocrats and Dickens makes a stark contrast in his novels. I’ve never really wanted to read about the streets of Victorian London at their worst, all grime and crime, with over-the-top villains and stupid self-sacrificing women. From what I have gleaned from my minimal dabbles into Dickens, his work has many great moments but can also be very hit and miss. I have read a lot more of his non fiction which I must admit I enjoyed hugely. Of course 2012 is the year of Dickens. 200 years since his birth. This has led me to read a lot more about the man himself. Dickens is a hugely interesting character flawed and great in equal measure. 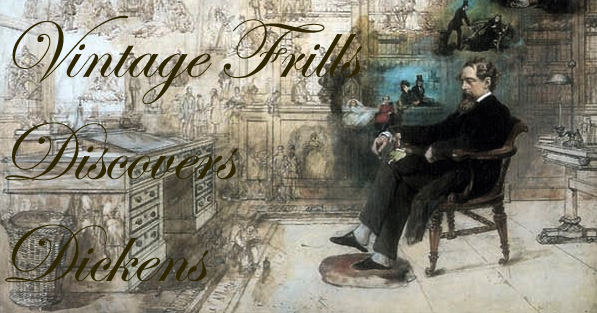 Having become completely fascinated by the author I feel it is time to give his work another chance, so Vintage Frills will now be discovering Dickens! Over the next few months I will try to read as much of his work as possible and visit any Dickens’ related sites that I can and write all about it right here. I will start by writing about Claire Tomalin’s biography of Dickens, and the Dickens’ exhibition currently on at the Museum of London. So watch this space for lots of Dickensian posts. And you never know I might actually enjoy it! Next Article Christian Grey, Brighton, Vintage and Car Boots!